Contemporary pottery is a strong area for the UK. Pioneering British potter, Bernard Leach, having been born in the Far east in the late 19th century, and trained in Japan, sought unrelentingly to establish pottery as a true fine art form in the UK. There was nothing new in art pottery being well established as a respected decorative art, but leach wanted to accommodate a raft of deep seated Eastern philosophies into the making of pots. In many respects he succeeded. His own inner battle, however, was to affirm within his work, the philosophy of 'spirit' or 'chi' taking precedence over the prominent Western values of 'ego' (and commercial success). The trouble with taking the wisdom of the Eastern ways to this extreme was that when Leach stripped out all materialism and pleasures of the 'ego', he ended up with pots decorated with brown glazes using similar repetitive shapes. To Leach, each piece had to have its own 'completeness' and 'harmony'. However, this uncompromising fine art simply wasn't what the UK market wanted to buy in enough quantity to keep Leach solvent. That is not to take away the technical brilliance of the wares. Lying under the surface was integrity and quality. On the surface was a rigid uniformity. In short, the immoderate Western eye, in general, felt the pots to be, well, a trifle earnest and dull. If the opposite of bling is plain, then the antonym of earnest is fun. How much pleasing of the eye and senses are we allowed? How Much Fun and Bling Are We Allowed? This is a serious question for us at Ceramic Fusion, as it is within contemporary pottery in the UK today. We are a team of artists and designers, and have much respect for the Eastern philosophy of 'chi' and the are wary of the dangers of 'ego'. However, if you take this thought process to the ultimate Zen summit, do you not end up living in a cave as a hermit? Or at least in a monastery in Tibet, forsaking all material niceties. In this segment we want to explore the work of serious studio potters who make consequential art pottery. But the critical thing for us is to see how the very best artists carry this mission off without ending up being plain and brown. Leach solved his own personal quandary (lack of commercialism vs wanting to make uncompromising pottery) in the end by earning a living in an educational capacity training a raft of art potters in the secrets of studio stoneware. He also brought out a range of 'standard ware', which was somewhat of a compromise for him. The 1920's and 30's were particularly tough as clearly, Britain wasn't quite ready for his message. Leach set up a training facility in Devon at the Dartington Hall Estate. Dartington Pottery was set up to market the wares of Leach's scions and supported initially by a specially formed trust and later the UK Crafts Council. The Dartington Pottery was continued by his son David. 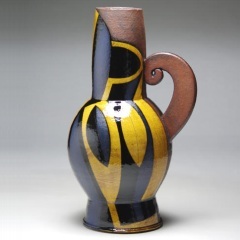 Today Dartington Pottery, is one of the leading exponents of contemporary pottery in the UK today. Here's a story which explains how Dartington sits as an important benchmark in contemporary pottery. As we were researching this segment, we put the search term "Bernard Leach" into Google images. There, before our eyes, was a superfluity of brown pots stretching to the horizon. 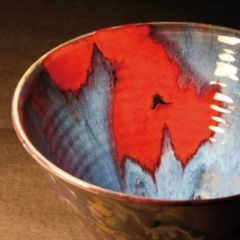 However, scrolling down the page, we stumbled upon an image of a beautiful bowl, quite Leach-like in its fine technical prowess, but with an arresting random splash of bright red, accented by a really nice shade of sky blue with deep reddy brown hooped staining and an interesting modern texturing in the front. Caught by this invigorating image and curious as to why Leach had strayed from his default browns, we clicked on the image to find out more and saw, to our interest, it was not Leach but in fact a pot by Dartington (see above photo for the bowl in question). Obviously, there are many studio fine art potters in the UK today. In putting together our selection of the people whose work we most liked, our inclusions had to be subjective. Richard Phethean is another juggernaut. For us his vases are like modern Moorcrofts. Outstanding. Assured. Not brown and earnest. Contemporary pottery at its funkiest. 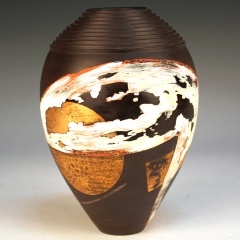 Tony Laverick is a serious Staffordshire UK potter with explosive ideas. Ex-Coalport and knows his stuff. Having known and met Tony in our past dealings, we are proud to be able to feature his work here. Daniel J Greening is a potter who, having researched a PHD in landscape art, brings an intellectual approach to his pieces which in no way reduces their very fine visual impact. 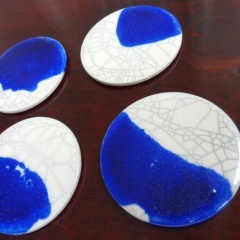 His interest in ceramics is to explore the quality of glazes and the way the natural materials interact.